Anna Lynn, 94 of Norristown and formerly of Centralia and Mt. Carmel passed away on Thursday, January 31, 2019 at Einstein Medical Center Montgomery in Norristown. 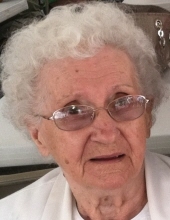 Born in Centralia on August 4, 1924, she was the daughter of the late Stephen and May (Plawynak) Shemonski. She was a retired seamstress having been employed in area garment factories. On April 19, 1962 in Saints Peter and Paul Ukrainian Catholic Church in Clifton Heights she married John J. “Jim” Lynn, Jr. who preceded her in death on October 23, 2011. She was a member of the Assumption of the Blessed Virgin Mary Ukrainian Catholic Church, Centralia and the International Ladies Garment Workers Union. Anna’s life purpose was to take care of many people. She also was greatly devoted to the Assumption BVM Church. Surviving are her son, Kenneth Lynn and his wife Nancy of Collegeville; three grandchildren, Ryan, Kevin and Elizabeth Lynn; and nieces and nephews. Preceding her in death in addition to her parents and husband were four brothers Metro, John, Harry and Michael Shemonski. Divine Liturgy will be held on Monday, February 4, 2019 at 11:30 am in Assumption of the Blessed Virgin Mary Ukrainian Catholic Church, Centralia. Rev. Daniel Troyan will officiate. A viewing will be held on Monday morning from 10:00 am until 11:15 am at the church. Interment will be private in Washington Crossing National Cemetery. In lieu of flowers, expressions of sympathy can be made to the Assumption BVM Church, 131 N. Beech St., Mount Carmel, PA 17851. To send flowers or a remembrance gift to the family of Anna Lynn, please visit our Tribute Store. "Email Address" would like to share the life celebration of Anna Lynn. Click on the "link" to go to share a favorite memory or leave a condolence message for the family.